With high winds, torrential rain and floods everywhere yesterday we were always going to be on the pond today and I don’t mind because you’re nearly always guaranteed plenty of bites. I got to the Oak and given the forecast was pretty awful for today with high winds and more rain coming in later, there were still ten hardy (or stupid) souls waiting to do battle with the elements and hopefully some fish! 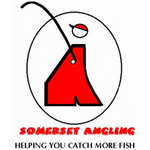 Along with the regulars it was nice to see John Dursley from Enterprise Angling fishing today. After everybody had finished their breakfasts and coffee we headed out the pond so Rob could decide which pegs to use. The first thing we noticed was that the pond was chocolate coloured and I said it would either be rock hard or it would fish it’s nuts off and I really hoped it would be the latter! Rob announced the draw and held out the hat which would decide peoples destinations for the day, I was hoping for a peg on the near side but pulled out peg 2 which I was fairly happy with. Bruce was my right hand neighbour for the day in peg 1 and Gordon was the next angler on my left in peg 4. 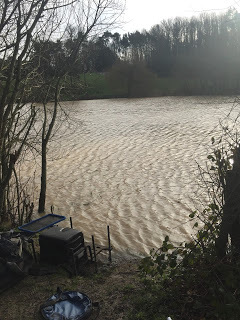 The level of the pond was also up a fair bit and water was hammering out of the overflow next to Bruce which meant there must have been a lot of water coming in via the stream which wouldn’t do John Dursley any favours in peg 17. As I was setting up, there were odd fish topping which I hoped would be a good sign and I said to Bruce I thought you’d need 8-10lb to win today. My rigs were the usual 0.5 gram Drennan Roach for fishing on the deck and a Preston Chianti for fishing shallow but I felt there was a good chance it wouldn’t get used again today! On the whistle I cupped in two balls of Pro Nat Dark at 10 metres before starting over it with a single red maggot on the hook, the rig settled and just sat there. I wasn’t too concerned at this early stage as in recent matches it’s taken 15-20 minutes to get a bite. Half an hour came and went with no indications and Bruce said he was still fishless too, from what I could see nobody on the road side had caught either and I think we had our answer to how it was going to fish today. Around the 40 minute mark, I had an inquiry which may or may not have been a bite, I struck anyway and the fluoro pinkie had gone which got me interested again. 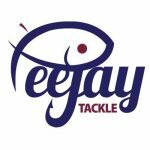 Bruce then swung in a little roach and a few minutes later I had an indication which I struck at and a better fish was on, I shipped back gently before slipping the net under a decent rudd of 6oz or so. Next chuck I bumped a small fish, Bruce had another little roach and I thought we’d catch well now that the fish had turned up. I should have known better and after two hours I still only had the one fish and Bruce hadn’t added anymore either, it was time for a walk. I was expecting similar tales of woe to ours so was a little surprised when Gordon said he had five small fish and had lost a better one, he was fishing a waggler close in and getting quite a few bites, when I got to Baz he said he had four or five fish as well but was struggling to get any kind of presentation with the wind hitting him head on. I said to Baz that I’d revised my estimate of the winning weight but still thought 4-5lb would win today! 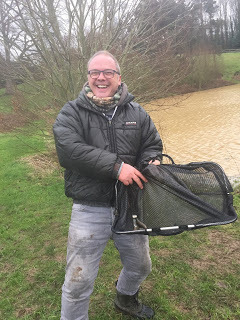 As I walked back past Gordon he said he’d had another fish so when I sat back on my box I plumbed up with the shallow rig at four sections on the inside lines and went in with a single pinkie but no bites and a brief try shallow long was also a waste of time. Bruce added a couple more small fish and I have to admit I just couldn’t understand why I couldn’t get bites, I asked Bruce if he was fishing really light but he said he was using a size 16 hook to 0.10mm so not really then! I decided to concentrate at 10 metres as surely some fish would find the bait sooner or later. 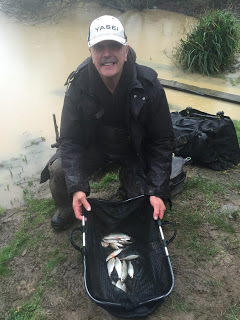 Over the next hour or so, Bruce continued to get the odd small fish including a couple that he foulhooked, the icing on the cake came when he hooked what looked like a better fish but turned out to be a 3oz roach lassoed around the tail! Great, so I was being battered by Rooster Cogburn! The wind was making it a real struggle to hold the pole at 10 metres so I decided to start a new line at 8.5 metres and cupped in a ball of groundbait and then put one in on the longer line (in case the wind died down later). I left it to settle while I tried the margins again but never had a bite there. Rooster (sorry, Bruce) was still getting the odd fish but I still hadn’t seen anyone on the road side catch a fish so I kept thinking that if I could get a couple more fish there was a chance of a default section win if Bruce, Gordon and Baz all framed! Over the next hour and a half, I went through the motions and drank all my coffee, which normally makes the float go under, but it didn’t work this time and as we approached the last half an hour I still only had a very lonely rudd in the net! Then out of the blue I had a bite on single red maggot and netted a nice 4oz roach, a few minutes later I had another little knock which didn’t develop further but when I lifted the rig there was a decent fish on! I started to ship back but the hook pulled out and on closer inspection there was a small scale on the hook which explained the loss. Then Steve P on peg 20 had a fish followed by Rob in 18 and as very often happens, a few fish start to show as the light fades. My next bite saw a foot of elastic come out and I carefully shipped back before netting a lovely roach of 8oz or so, I had two more little roach where the float just lifted a bit and then Rob blew to end the match. Why couldn’t those fish have switched on an hour earlier? 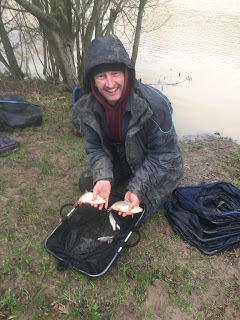 Bruce had finished up with 22 fish and as I took my kit back to the car I asked Gordon how he’d done and he said he’d had about 15 or so and Baz had around a dozen, Terry’s keepnet was already packed up! Gordon had the scales and I had a feeling it would be a very tight affair today with just ounces in it, Rooster Bruce was first to weigh and his fish went 1lb 7oz and when I pulled my net out he said it was going to be close but the needle stopped just short at 1lb 5oz, then we got to Gordon and you can tell he’s been fishing with us for a while as he had way more than 15 fish and weighed 1lb 15oz to go into the lead. A rather windswept Baz weighed 11oz and then Terry had his meagre haul in his landing net and weighed 4oz. We drove round the other side for the results and Steve P had the top weight over there with 6oz!, it had been a really tough day. Poor John Dursley ended up having to use a 3 gram rig to try and combat the flow coming from the feeder stream, he only had a couple of fish and didn’t bother weighing but I hope it hasn’t put him off and we see him again. 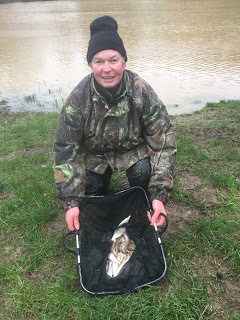 So Gordon won today which I believe is his first win since he’s been fishing with us so well done mate, Bruce was second and I finished third and picked up £20 plus a nugget off of Steve who won his section and Baz won our section by triple default! Bruce was second with 1lb 7oz and after today’s performance will soon be swapping his baseball cap for a cowboy hat! So a really tough day for everybody and I was nowhere near with my original estimate or even the revised one! I think that’s the second lowest winning weight in all the years I’ve fished it and you’d never have believed we were sat round a pond with so many fish in it! Conditions didn’t help and the pond was just too coloured, it’ll probably fish it’s head off next match (or is that just wishful thinking!). Who the hell is Rooster Cogburn?! Nice blog mate. That Terry is the chap who fished above me on the Isle last weekend. Ha ha, I'm showing my age then, John Wayne was Rooster Cogburn in the film True Grit, it was also remade in 2010 with Jeff Bridges starring as Rooster!